Professor Philippe Piot in the Department of Physics is working on a plan to build a portable device that could be taken to airports, sports stadiums or subway stations to detect radioactive material. 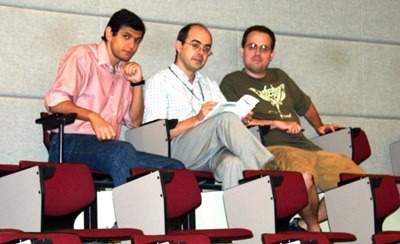 Professor Philippe Piot (center) with graduate assistants Mohamed Radwan (left) and Christopher Prokop. A $591,000 grant from the Defense Threat Reduction Agency is funding Piot’s project. The agency’s goal is to help the U.S. Department of Homeland Security to thwart terrorism attempts. Piot and two graduate assistants, Mohamed Radwan and Christopher Prokop, will work on the project during the next three years. If successful, the portable accelerator could become a crucial tool in fortifying the nation’s security system, he said. Piot also is working on a project at Fermi National Accelerator Laboratory in Batavia to develop a technique enabling the production of bright electron beams to drive next generation coherent X-ray free-electron lasers. The University of Chicago provided a $56,000 seed grant to Piot in support of the project. He is working with colleagues from Argonne National Laboratory and Fermilab to develop instruments capable of characterizing the unprecedented parameters of the produced bright electron beam at a facility in construction at Fermilab.